This story of a woman being reunited with the beloved dog she had to give up as a child is so moving, you could call it a fairy tail. 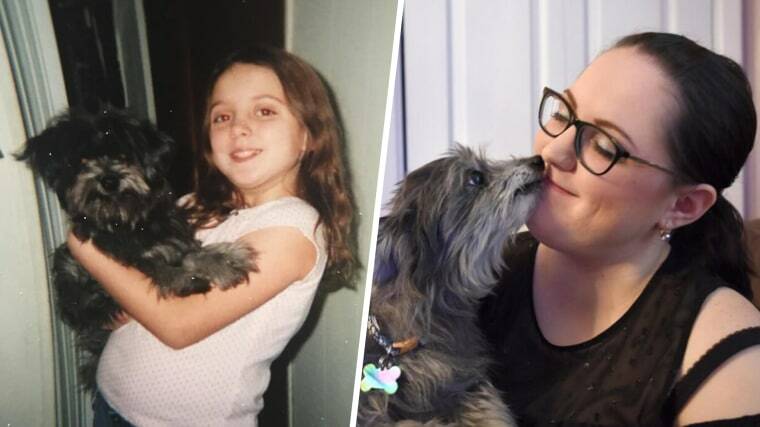 Nicole Grimes was 10 years old when her grandmother gave her a puppy named Chloe. "She was wearing a pink bow when Nana gave her to me. We were best friends," Grimestold the BBC. A few years later, when Grimes was 14, her father got a job in customer service, working from the family's home in Marianna, Pennsylvania. Chloe barked a lot, and that put her dad's job at risk. The family made the difficult decision to try to find a new home for Chloe. When that didn't work, they brought her to the local animal shelter. Grimes told TODAY she wasn't angry with her parents because she understood how hard this was for them, too. But still, "I was really sad because I loved the dog," she said. Grimes thought a lot about Chloe in the years that followed. She and her mom spoke frequently about Chloe, and "I always remembered her birthday: Oct. 26," she said. Recently, Grimes started contemplating adopting a dog of her own. She is now 21 years old with a job as a pharmacy technician, and married. She and her husband have a 4-month-old daughter. The family lives in Brownsville, Pennsylvania, about half an hour from where Grime grew up. Grimes thought when her daughter turned 1, it would be a good time to adopt. Then about two weeks ago, a Facebook friend posted photos of an elderly dog, whom she was looking to rehome. The small gray dog looked uncannily like Grimes' childhood pet. "It just reminded me of my old dog. So I decided to take her in," Grimes said. This new dog's name was Chloe, too. The similarities didn't end there. This Chloe was 11 years old, which is the age Grimes' childhood pet would have been. That Chloe and this one even acted the same, giving out lots of kisses, and having huge amounts of energy. "The only difference," said Grimes, is that this Chloe is "smaller and doesn't have teeth." Grimes' husband had serious doubts that this could be the same dog. But she thought differently and brought Chloe to the vet. A microchip scan confirmed that this was indeed Grimes' dog, her Chloe. "I knew in my heart," Grimes said. The reunion feels especially poignant to Grimes because her grandmother, who gave her the puppy when she was young, died three years ago. She is also heartened, knowing that Chloe's years between living with her have been good. She's learned that Chloe spent most of the last seven years living with an elderly couple. They died, and she went to live with a neighbor, Grimes' Facebook friend. "She had truly a great life," Grimes said. "A very loved dog." Chloe continues to be very loved. She and Grimes' daughter are becoming close, which Grimes finds "so cute to watch." Chloe still barks sometimes, but with the current situation that isn't a problem. These days, in fact, there are very few problems indeed. "I felt like I won the lottery," Grimes said. "I never thought I'd see her again."